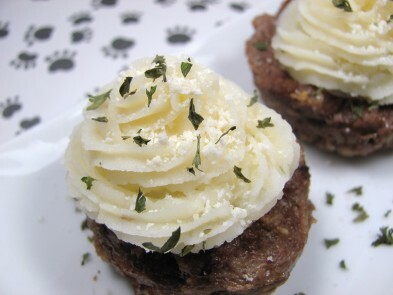 These meatloaf cupcakes are perfect for any doggy occasion! 2. In large bowl, mix all ingredients for the muffins. Form meatloaf into balls and lightly press them into each cup. 3. Bake for approximately 20 to 30 minutes. 4. 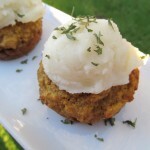 While the meatloaf cupcakes are in the oven, make your mashed potato icing*. Set aside until cupcakes are ready. 5. 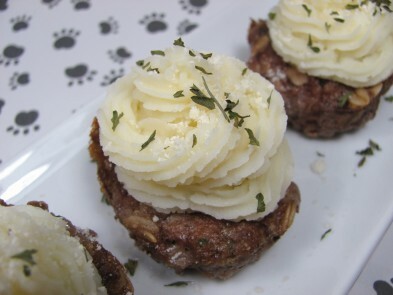 Pipe the mashed potatoes on top of the caupcakes and garnish with parmesan cheese and parsley. 1. Wash and chop potatoes. 3. 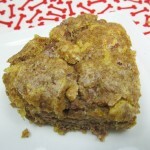 In a microwave safe bowl heat butter and milk until butter is melted. 4. Using a potato masher blend butter mixture into potatoes until smooth and creamy. oh my. they look delicious!!! you are very creative! 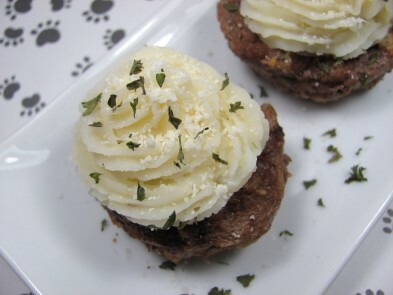 Can these be frozen for later?my pup would love these! You can Jen, but only for about a week. Woof!